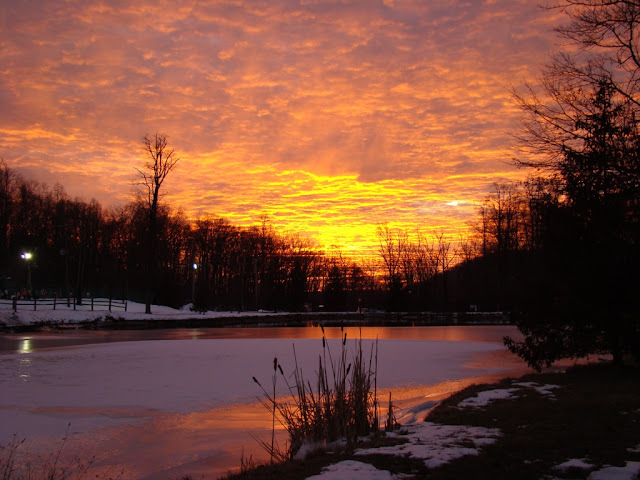 The sunrises and sunsets here at Roundtop this winter have presented more than a few spectacular displays. It takes clouds to make a truly beautiful sunrise or sunset. Clouds create unusual and breathtaking colors as the angle of the sun’s path changes. For a few moments or minutes. After that it all turns to just clouds. And that’s how January has been here—cloudy. 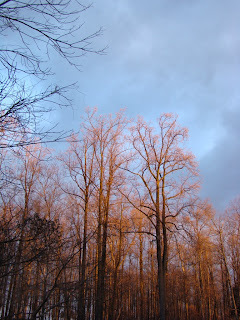 In many, perhaps most, Januarys here the sky varies between storms and sun. It snows, then it clears and eventually it snows again. This year, we’ve had some of the snow and a fair number of storms, but little of the clear blue skies that usually follow. The cloudiness has remained, a somewhat unwelcome visitor except for those first and last moments of the day. January daylight is already in short supply. The sun’s rays are weak and the hours of day short. To have what sunlight is possible limited even more by clouds is starting to feel a bit confining to me. I’m not sure it’s seasonal affective disorder so much as photographic withdrawal. In January, a cloudy sky makes the weak light even dimmer, and the hours or minutes when I can take photos even fewer. Nothing can be done about it, of course. It’s simply a matter of waiting for that clear sky to reappear, for the days to grow longer, for the sun’s angle to grow stronger again. The sunsets and sunrises are glorious and so help a bit to mitigate my impatience, for that’s what this really is. Neither the world nor the sky is as I would will it, and sometimes I just need to remind myself of that. 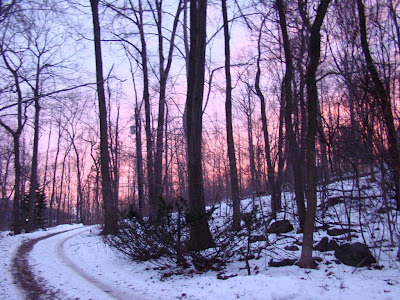 A little winter Appalachian glow greeted me at sunrise this morning. After yesterday’s wind, downed trees, power outages and now flooding, a clearing sky is a welcome sight. The storm Sunday and yesterday got rid of the snow that had blanketed the forest. Now, the mountain looks like late November again. I quickly checked the long-range forecast to see when snow might return—perhaps this weekend, but I’m not going to hold my breath. This morning a rabbit hopped in front of Dog and me, the first I’ve seen in a while. Likely the open ground makes foraging easier for it. I know my chickens like it. Snow is not really their forte. The Canada geese are also back on the pond, as the rain opened a corner in the ice so they can swim around again. I am ever amazed at how quickly and readily the forest animals take advantage of improving weather, even after a violent storm. They are not shrinking violets, first sticking up a timid nose or a beak to test the air. The idea of PTSD must be foreign to them. The weather improves, and they are out and kicking up their heels. They seem to enjoy the improvement but certainly aren’t hesitant to be out and about again. They don’t look at the sky and wonder when the next big storm will come. They don’t wait a day to make sure the weather holds before venturing out again. It’s better. They are out. End of story. My second photo today is how Appalachian glow looks from the inside. The trees overhead just lit up during sunrise this morning. Remember those scenes in Close Encounters of the Third Kind where the clouds winked different colors whenever one of the big UFO’s was near? That’s what I thought of this morning as I was out walking the dogs. Only I didn’t have UFO’s. I had lightning. And wind. Lots and lots of wind. The dogs didn’t get much of a walk. Actually, the walk started out well, but I hadn’t gone far before the wind started to pick up and branches started falling, and the power went out all over Roundtop. That’s when I saw the lightning and thought of Close Encounters. So back up to the cabin we went. I gave up resetting the clocks after the third time. Eventually, the weather will settle out, and then I can reset the clocks. So far I am fortunate in that nothing major has fallen on the cabin. Still, I stopped the car three times this morning to remove branches from the road that were larger than I wanted to drive over. One time the branch was really half a tree and was too large to move. I just barely had enough room to squeeze by but I did. 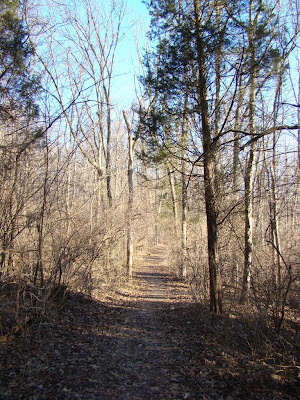 On Saturday, the weather was nice enough to go for a hike in the woods and do a little birding. My tally for January so far is 37 species, not too bad. I have hopes that one year I will break 40 species in January. It’s never happened yet but is theoretically possible. For that to happen I will likely need a decent year for winter finches and some decent birding weather. Lightning and wind storms won’t cut it. Maybe next year. Even though 2010 is just 20 days old, it’s already proving to be different from its predecessor in at least one thing. 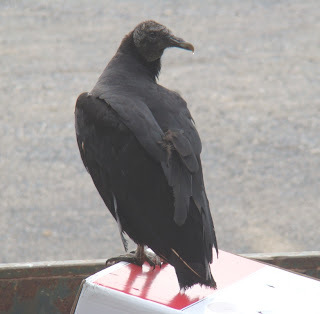 I am regularly seeing black vultures plying the skies around Roundtop. Black vultures, as you may know, are really a southern vulture. Until perhaps 20 years ago, I’d never seen one in Pennsylvania. For the past 10 years, they’ve been rather common around here during migration and in summer. But not in winter. I could hope to find one on the first warm, sunny day starting around mid-February, but anything before then was out of the question. This year, I have already seen 10, spaced one or two at a time on different days, often with 3-4 turkey vultures. Several are likely the same birds. This morning I saw one on the drive to work, in roughly the same area where I saw one late last week. On Monday, I saw two near Pinchot State Park with what was probably the same group of Turkey Vultures that I saw the week before. Still, in previous years finding black vultures on January 1, no matter if that day was a warm and sunny one, simply wasn’t going to happen. This year, finding the birds in January wasn’t a fluke. I’m seeing them regularly. And perhaps even this wouldn’t feel so unusual to me if January 2010 had turned out to be unseasonably warm. Oh, the past few days have been unseasonably warm, but the vultures were also seen on days when it was anything but warm. Even more interesting, the three to four weeks leading up to now were unseasonably cold, and I still saw black vultures. It makes me wonder what will happen in the next 20 years. Will black vultures become the dominant local vulture? Will turkey vultures become the minority? All this drama, and the year is just 20 days old. This past weekend brought a wide variety of weather to Roundtop—sunny, warm, heavy rain and wind. All things considered, I preferred the non-rainy, non-windy days. After the recent spate of cold and wind, a day in the 40’s felt like almost summery. And in case you think I’m exaggerating, yesterday I saw four young girls in t-shirts walking along the streets of the nearby town. So it wasn’t just me, though I do think you actually need to be 9 or 10 to go out in t-shirts in 40-degree weather, though I’m not yet too old to at least think about it. With the rain went the snow and much of the ice. On the snowmaking ponds where the ice never gets too thick, I saw open water on Sunday. 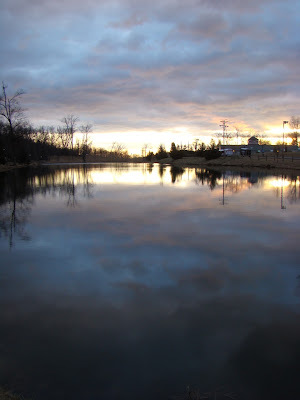 On Pinchot Lake, I saw people ice-fishing yesterday, but watching them made me a little nervous after all that rain. I didn’t hear about anyone falling in, though, so I guess it was alright. 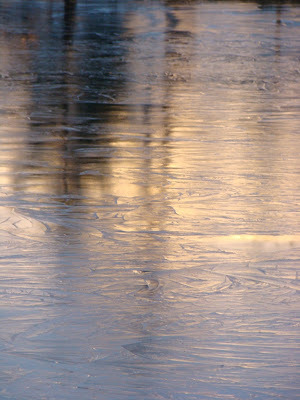 By Monday, as the temperature was already dropping back down, the ice began to form again. 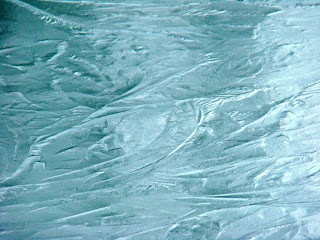 That’s what today’s pictures are—the thin ice forming over top of the snowmaking pond. January thaws never last forever, though I wouldn’t have argued about another day or two. Yesterday, the sky produced an embarrassing amount of glorious colors. The sunrise, with photos posted yesterday morning, was exceptional. The sunset went beyond exceptional and turned into the kind of thing seen only a few times in a lifetime. I was fortunate to be arriving home just as the sunset neared its peak. So I was able to use one of Roundtop's snowmaking ponds as the foreground for the photos. 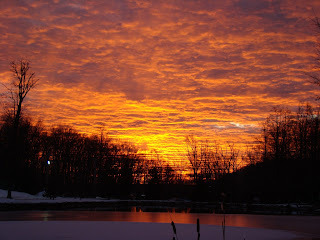 The sunset reflected off the ice on the pond, heightening and extending the colors in the sky. I was lucky in this, too. 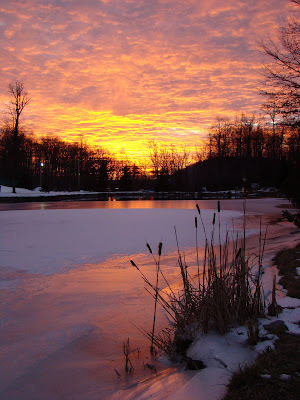 Because the ponds are the source of water for snowmaking, they are rarely iced in. The recent cold spell helped keep some ice on the pond even so. And one nice thing about the sunset is that it lasted quite a bitj longer than the sunrise, which was also lovely. That didn't last very long, though. The sunset went on for minutes, growing ever deeper in color as the minutes went on. Eventually, as we all know, all good things come to an end, but even the last gasp of the sun's setting was glorious. I wish you could have been here. I hope your own sky embarrasses you with riches. The sky is overcast this morning, the wind a tad raw, if not quite as raw as the day before. This morning the cloud cover made the pre-dawn minutes darker than is so on a clear morning. I went outside to take fresh water to the chickens, glancing quickly at the gray sky and wishing for the promised warmer temperatures to arrive sooner rather than later. And barring that, I would settle for the wind to calm so the temperature I had would at least feel warmer. The chickens’ water freezes solid overnight, so I switch their water in the morning and evenings. They were just waking up, and I don’t like for them to go without water even for a few minutes after a long night. This morning they ambled over to the fresh water, in no hurry, so I knew I wasn’t late bringing out the new water. And then I turned to go back into the cabin and saw the morning sky suddenly turn a bright pink, like a young girl’s blush. The camera was close at hand, so I quickly snapped a few shots. None do the sky’s glory any justice, but perhaps you can get a sense of it even so. Perhaps the photos will remind you of some similar morning where you live, an old memory made fresh again by a triggering similarity seen today. 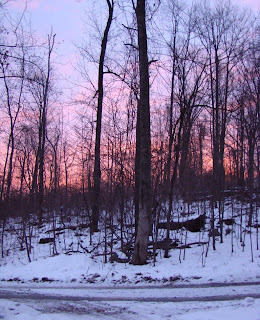 If I’d had a choice, I would have chosen a more interesting foreground for the sunrise than a veil of winter’s trees, but sunrise waits for no camera and for no mad dash down to the pond or anyplace else. This sunrise lasted just a minute, perhaps two, before it paled and disappeared behind the gray clouds. I carry the memory of it with me this morning, a rosy glow against the drab. Snow dusted the mountain last evening, just enough to make walking slippery this morning. The new snow covers both ice and bare patches, so I can no longer tell one from the other. 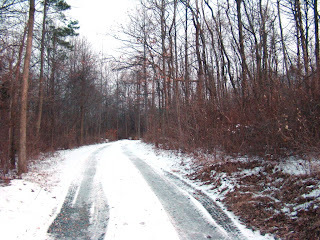 I step out smartly, only to slip and nearly fall when my boot finds the ice. As cold as it has been for the past 10 days, I am surprised to still find some open water. The faster moving streams are still open and gurgling. That running water attracts the forest residents, too. For them, finding water in winter is nearly as much a chore as hunting or browsing. Tracks crisscross the banks of open streams, to the point where it’s difficult to make out who was visiting. 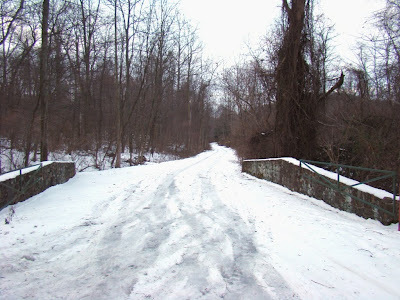 Newer tracks cover and obliterate other tracks, while at the iced-in streams the snow is unmarked. A slight moderation of the temperature around Roundtop will bring temperatures near to 40 in another day or so. I may take to a t-shirt again, if that happens. It will feel like summer. 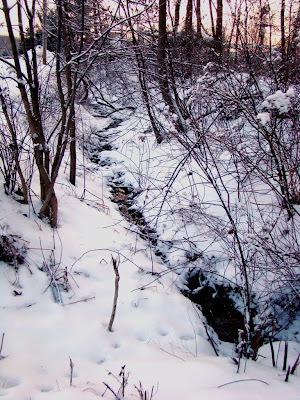 Perhaps a few days of that will be enough to break the ice on some of the other little streams around the mountain. I’m sure the deer and fox and rabbits would appreciate that. The weather was lovely this past weekend—cold, but sunny. Best of all, the wind didn’t come out to wreak havoc play, so I am happy with winter again. This was the kind of winter weather that’s fun to play in and be out in. 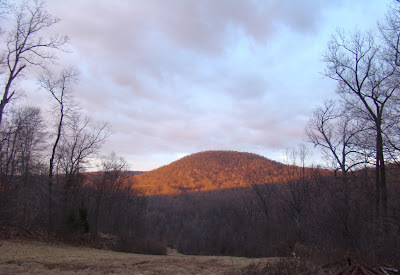 I took advantage of it to wander around in the woods, visiting the gamelands that border Roundtop Mtn. 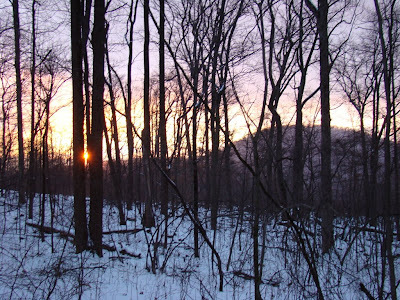 To most people, perhaps especially in a snow-covered winter, the gameland forests probably don’t look much different than the woods around Roundtop. But to me, who knows Roundtop so well, these woods are different enough to be interesting. 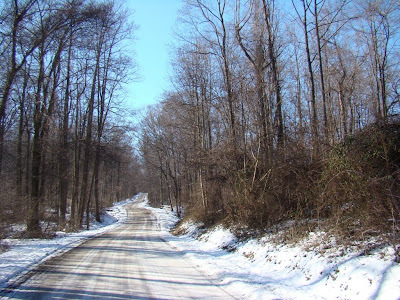 Most basic, at Roundtop I am usually on a hill or in a deep, dark and narrow valley between hills. Down in the gamelands, I have wide open vistas to enjoy. On a bright winter afternoon with a sapphire sky overhead, that’s a nice difference. The gamelands have more “edge” habitat than Roundtop, so I get to see more sparrows—something usually in short supply up on Roundtop. 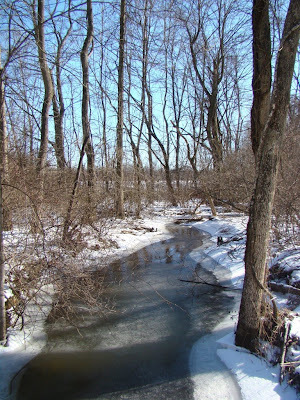 Occasionally, the woods open up and give way to old fields where I can see bluebirds and a few robins flocking together, the odd mockingbird or a Cooper’s Hawk gliding overhead. Dog came along with me for my ramble, and a good time was had by all. The winter season is still early, and I hope we can have many more days like this one to enjoy. I hope the bitter, windy days and overcast skies are gone for a good, long while. A little snow fell overnight at the cabin. A little snow makes everything pretty. An ugly pile of leaves suddenly becomes a lovely, snowy bump, an interesting feature in an otherwise flat area. The same holds true with lawn furniture and old buckets. Sometimes spring can be a shock when I discover what’s actually under those pretty bumps. The latest spate of cold weather will begin tonight and last through the weekend. 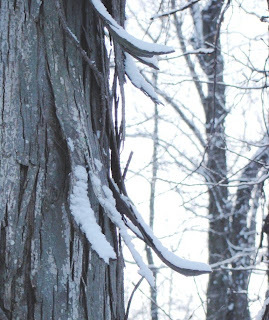 At the moment the winds are still calm enough for snow to stick on twigs and branches or the bark of an old hickory tree. The upcoming cold wouldn’t, actually, be bad at all if it was unaccompanied by wind. The forecast suggests my hope for that is a pipedream. So this morning the dogs were silly in the snow, and the chickens scratched happily to discover they could reach bare ground. The wild birds, I think, know something is coming. They were already rushing my feeders before daylight was well-established. And me? I’ve got my snow pants ready for the weekend, and an extra box of tea bags awaits to warm me up from the chill ahead. The last of the “warm” weather will end today. At the moment I’m defining warm as maybe reaching 35 degrees. More snow is on its way followed by what is becoming the usual weekend cold and wind. I took advantage of the calm to make sure the dogs got a good walk this morning and let the chickens outside the pen for a few minutes. None of my brood may get much in the way of walks or outside time over the next few days. At the moment, wind is running in a tie with ice for being my least favorite outside phenomena. Ice is more of a fooler, though. A path that is snowy one day quickly turns icy after a few hours of sun or footsteps that pack down the snow. One step is safe and easy, the next a slippery accident waiting to happen. When it’s icy everywhere, I wear Yak-Trax over my boots, but they can be a pain to put on and wear over the long haul. So I end up not wearing them unless I have to. The problem is, I can’t always tell when it’s okay to not wear them. This morning even Dog miscalculated a step while he was fooling around and slipped sideways. He looked embarrassed, I thought, and with good reason as he at least has four legs to my two. I haven’t seen one of the chickens slip and fall, yet. They don’t much care for the snow, but willingly walk along an icy path, looking for a tiny patch of bare ground to peck at. When one finds a patch, she is soon happily joined by all of them. It doesn’t take much to make a chicken happy. 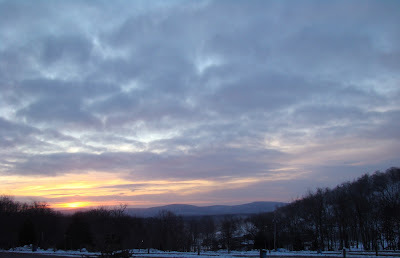 The mornings are still too dark, really, for me to be taking photos for Roundtop Ruminations before I leave for work. But I can’t help myself. The day is brightening, and I don’t really like taking a week’s worth of photos over the weekend. So today’s photo is a bit washed out and certainly gray, but it also marks a small milestone—the first photo taken in the morning again as the days lengthen. The snow cover helps. Without that, I likely wouldn’t be able to take morning photos for perhaps another few weeks. Today, I am enjoying the last day of “warmth” before the temperature nose dives again. Today, even at my cabin, the temperature will likely reach and perhaps just inch above the freezing mark for the first time since last weekend. And better yet, the wind this morning was little more than a breeze, so I and the dogs actually got a half-decent walk. We all needed that. Although the snow isn’t deep at the moment, it is already proving to be harsh on the deer around the cabin. Usually they don’t resort to eating my juniper bush until late February or early March. They are already nibbling on it, a sure sign that natural food is scarce as juniper bushes aren’t known as a deer’s favorite meal. About half a mile or so beyond the cabin is a small field where I counted 15 deer the other night, far more than I’ve seen at any one time there. They poked in the snow with their hooves, looking for the grass underneath to browse. It’s the kind of work that appears to me to be more calorie intensive than it would be worth, but they were hungry enough to do it anyway. Usually, this is the kind of activity I see later in the winter, so if this year doesn’t produce a thaw or three, I predict hard times ahead for the forest’s animals. I know I wouldn’t be wanting to try and find food enough to keep me alive through the winter in the woods right now. Now that the holidays are over and my daily routine is back to "normal," I am outside during daylight hardly at all again. The woods around me are snow-covered, which means I’m not seeing winter fungus either. So, not much is going on that I can see during the week. The days are already lengthening a bit. A few birds are now up and arriving at my feeders during the half-light of dawn before I leave the cabin. Cardinals are the earliest of my arrivals. Perhaps half of the juncos that regularly appear show up early as well. I’m noticing that the Carolina chickadees arrive perhaps 10-15 minutes earlier than the black-capped chickadees. Black-cappeds are still the most numerous, about twice as common as the Carolinas, but the Carolinas are first to the feeders. I’d like to know if others who see both species observe the same thing. Another observation is that the woodpeckers don’t arrive at all before I leave the cabin. I guess they like to sleep in longer than the little birds. I still have no sightings of winter finches to report. My best sighting of the new year so far was of a belted kingfisher down at the old snowmaking pond. That’s the first record I’ve had during January. One bird, perhaps the same one, was a regular into December, and I was surprised at that. My best non-Roundtop sightings were two flocks of gadwall at one of the area’s larger spring-fed ponds and three black vultures at the local state park. 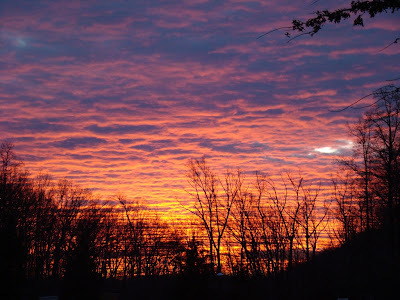 My photo today is of the sunrise this morning as I left the cabin. Snow flurries danced around the forest this morning. You can see that the morning clouds are snow clouds, but I don’t expect any serious snow today. The mornings aren’t really light enough yet to take photos in the woods before I leave the cabin, but it’s getting close. Maybe next week. I don’t usually make New Year’s resolutions, so I’m not going to call this idea of mine a resolution. Even though I live in the woods, I don’t always have lots of time to get into the woods, especially woods other than the one around my cabin. So this new year, I want to spend more time birding and otherwise outdoors than I’ve been able to recently. Of course, just saying I want to do that isn’t the same as figuring out how to do that, and I’m happy to report that I’ve even come up with a plan. Part of the problem is that when I want to visit other areas, finding time to get there is difficult. It’s one thing to want to go birding in one of my area’s premier locations. It’s another to find the time to drive 45 minutes, spend a few hours birding and then drive 45 minutes home again. Finding a minimum of half a day to go elsewhere is a big issue with me. So, I’ve decided to use my limited free time to go birding or walking whenever I do my normal activities. For example, when I go to the grocery store, I will stop at a local park that’s on the way. I may not stay long, but I can sure add in 15-20 minutes of birding or wandering around before I go to the store. When I visit family, I’ll stop at the spring-fed pond a mile or so further up the road to look for waterfowl. I still hope I’ll be able to find time, occasionally, to go to one of the really great refuges or forests in my region, but I’m not going to let that be an excuse to miss out on some of the smaller sites that are just past my own doorstep. My photo today was taken off my back deck on January 2. The sunset was an especially pretty one, all mauve before yet another day of 30+ mph winds. If this wind keeps up, I will soon demote winter from my favorite season!